SunBriteDS’s concierge-level customer service makes for efficient installations while high-performing weatherproof products result in a brand-appropriate and versatile fit for Yard House’s various outdoor locations. Based in sunny Southern California, integration firm No Static Pro AV isn’t accustomed to the broad spectrum of severe weather conditions that SunBriteDS outdoor displays are engineered to withstand, but its clients like Yard House Restaurants certainly are. SunBriteDS’s concierge-level customer service makes for efficient installations while high-performing weatherproof products result in a brand-appropriate and versatile fit for Yard House’s various outdoor locations. More than forty of Yard House’s fifty locations feature outdoor balconies, patios, decks, and fire pits. While some of these areas are covered or protected from bright sunshine and rain, many of Yard House’s locations across the country present challenges, such as the hot desert in the Southwest, Florida’s humid, salty air, and the unpredictable storms that often strike the northeastern U.S. Designed for permanent outdoor installation, SunBriteDS displays are carefully designed to function flawlessly in a wide range of environmental conditions, including extreme temperatures, salt air, grease, dust, insects, rain, snow, and all other forms of moisture. Gene Gordon, CEO of No Static, began his firm’s relationship with Yard House fifteen years ago and with SunBriteDS in the mid-2000s. More recently, Gordon’s team was responsible for all of the AV equipment at the newly opened two-story Yard House at the Las Vegas LINQ, a project that involved ceiling speakers, loudspeakers, signal processors, and SunBriteDS outdoor displays. The LINQ location features five SunBriteDS units that stand up to the Las Vegas desert’s fluctuating day and nighttime temperatures. SunBriteDS displays feature internal regulation systems that keep them running smoothly from -24° to 122° Fahrenheit. 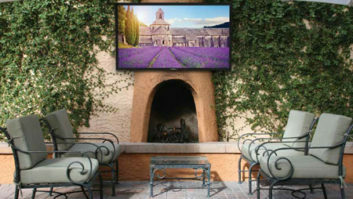 Additionally, sealed cable-entry points keep out desert sand and a durable powder-coated exterior prevents cosmetic damage, two problems that indoor televisions aren’t able to handle. In addition to Yard House, Gordon does work with clients closer to home. One, located on the Venice Beach Pier in California, recently upgraded from a standard TV fitted with a makeshift housing to a SunBriteDS in order to overcome the pier’s salty air and fog. The constant moisture had not only quickly deteriorated the prior TV but had also hazed the Plexiglas housing and obscured the view. SunBriteDS displays start at $1,495. Screen sizes range from 32- to 65-inches, models are available in landscape or portrait orientations in black, white and silver colors. Touchscreen capability can be implemented for way finding, interactive menus and guest services needs. For larger orders, customized colors are available for a brand’s aesthetic consistency. Jacobs refers to SunBriteDS as a major element of the Yard House experience. She explains that the brand aims to find the right balance between sports bar and restaurant, making the visual element just as important as the food.